Tile'm all by Dimitry Bogaevsky is an incredibly hard puzzle game for iPhone and iPad. but there is a clever variation, which I had never seen before: when two neighboring tiles are the same color, they merge, and from then on they can only move as a single piece. The goal is to merge all pieces of the same color. which is already a lost position: continuing from here, you could for example merge the two yellow tiles and the two red tiles, but only leaving the green tiles split into two groups. The game contains 119 levels. The first three are 3x3, all the others are 4x4. Puzzle #4 is pretty difficult already. These puzzle feel claustrophobic, because every time two pieces are joined your movement options are reduced. Reaching the solution requires careful planning from the very first move, otherwise you'll inevitably end up blocked. There's support for undo, but only of the last move, so to try different strategies you always have to restart from the beginning. If you get stuck on a puzzle—and I guarantee that you will—there's a built-in hint system that allows to see a solved position (which is not necessarily the only one). Finding the moves to get there is still up to you, but knowing where the tiles need to go is a huge help. The hint system is locked at the beginning and can be unlocked with a single in-app purchase. Once purchased, you can use it without limits. So be careful not to spoil the fun. The user interface in this initial release is a bit rough and sluggish, detracting somewhat from the enjoyment of the game. For example, the movement of tiles while you drag them is a bit choppy. The most serious shortcoming, however, is the puzzle selection list: you have to scroll puzzles one by one, with no trace of inertial scrolling, and they scroll horizontally instead of vertically. It works very differently from the standard iOS controls. I think the game would greatly benefit from using a master-detail layout like Lazors or Subaku. My final worry is that all the puzzles have a similar checkerboard pattern. This is unavoidable because of the rules: at the beginning there can't be two tiles of the same color side by side, otherwise they would be merged immediately. This might make the puzzles feel repetitive after a while. This game is highly recommended for its novel mechanics and frustrating difficulty. I hope the user interface will be significantly improved in future updates. I'm usually suspicious of puzzle games that have "easy to learn and difficult to master" in their description, but Subaku by Eric Koziol is good despite that. I'm also totally bored by sudoku, but thankfully, despite the misleading icon and the suspiciously similar name, this is a completely different puzzle. If you are suspicious too, there's also a free version called subaku mini, which contains just the first 10 puzzles. The game is played on a 3x3 grid, containing some numbered tiles. when a row, column, or diagonal contains three identical numbers, they are all removed. The goal is to clear the board. There are 100 puzzles included; the list is well presented with colorful thumbnails, and a target number of moves needed to solve the puzzle. Note that the target isn't always the optimal number. I'm used to being shown what the optimal number of moves is, but I'm beginning to like the idea. Interestingly, the 100 puzzles are not sorted only by the target number of moves. First they are sorted by the number of initial tiles, then each group is sorted by number of moves. One of the hardest puzzles should be this one. There are many options, some of them quite unusual like using kanji numbers, or removing numbers altogether (and using only colors instead). There are many inventive Game Center achievements too. Additionally to the puzzle mode, there's an endless mode where the goal is to play as long as possible without clearing the board. To make it interesting, random events happen every 5 moves. This game mode is good for casual playing. One criticism I have is that if you tap the menu button, you are brought to a crowded screen with several unrelated options: return to game / retry / return to menu / previous / next. I think this is a confusing choice and the user interface could be simplified. But that's a nitpick; the game has original mechanics and is fun to play, so it's easily recommended. Mouse Trapz by Delicious62 LLC is probably one of the puzzle games for iPhone and iPad with the most complicated rules. The end result is quite interesting. The rules are: mice are scared of cats. Cats are scared of dogs. Dogs are scared of monkeys. Monkeys are scared of humans. And humans are scared of mice. But that's not all! Mice like cheese. Finally, all animals are scared of firecrackers. The play area is a 10x10 grid, containing some background, some animals/humans, and, most importantly, some mouse traps. The goal is to send every mouse into a trap. To achieve the goal, you are given an inventory of animals/humans that you need to place on the grid. When you tap the Start button, the characters will start to follow the game's rules. For example, if a mouse is next to a cat, it will start running in the opposite direction. In the example above, placing the human next to the monkey will cause a chain reaction until the mouse runs into the trap. What if an animal is subject to conflicting forces, for example a mouse is next to two cats? Easy: they'll just stop, puzzled, with a question mark over their head. In most levels there is also the secondary goal to collect "coins". In the example above, the coin needs to be collected by the dog. Each collected coin awards a hint that you can use when you are stuck on a puzzle. It's also possible to buy hints using in-app purchases. The variety and complexity of the puzzles that are generated by the set of rules is endless. Initially you just need to make characters run in one direction, but soon the running paths need to zigzag around the board, and then timing also becomes crucial, because you need to make the paths of different animals intersect at the right time. This requires careful planning, because you need to figure out everything in your head before tapping the Start button. The game comes with 100 prepackaged levels. A nice detail: each level has a title, often a joke like "What's Up Dog?". There's also a level editor, and the ability to play the levels created by other users (hundreds of them). Because of its nature, I think programmers will find this puzzle appealing. But it should also be interesting for all people that want to measure against a nontrivial set of rules. 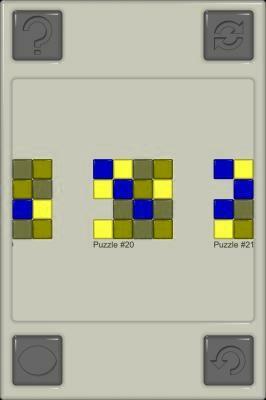 Blockhouse is an old puzzle game by Kory Heath which was released in 2009. It's a classic, so if you missed it back then, it's not too late to check it out. There's also a free version, Blockhouse Lite, which contains different puzzles, so it's worth getting it even if you buy the full version. The game mechanics aren't new, and weren't new when Blockhouse was released, either. It's a tilt maze: swipe in one direction, and all blocks move in that direction until they hit something. The goal is to move every piece to a specified target position. Note that just passing over the target position isn't enough: every piece must stop exactly on the target, at the same time. This requires some planning, and it's definitely unlikely to stumble on the solution by accident. Hint: it is often easier to solve the puzzles by mentally going backwards from the goal position. Kory Heath wrote a very informative post about how he created this game. It's a goldmine of information for people interested in what it takes to make a nontrivial game. This is definitely not one of those characterless, randomly generated puzzle collections. A great feature, unusual for tilt puzzles, is that it is impossible to get stuck in an unsolvable position. No matter what you do, it's always possible to reach the goal. This reduces stress and encourages random tinkering during the early stages of a puzzle; but you will have to use your brain to solve it. There's only one bad part in this story: Kory Heath hasn't had time to make Blockhouse 2. But there is still hope, I guess. Perplexagon is an interesting free puzzle game for iPhone and iPad that you've never heard of. I downloaded it some time ago, and initially I didn't like it much, but it grew on me after getting used to the quirks of the user interface. The playing area consists of two or more regular polygons, with a variable number of sides, connected to one another by a side. Each polygon is divided into colored triangles. To make a move, you touch a polygon and swipe. This causes it to swivel around a vertex until it touches another polygon. If the triangles that touched have the same color, they turn black. The goal is to make all triangles black. There's a total of 30 levels, which must be solved in order. Interestingly, the "par" indicated by the game for each puzzle doesn't seem to be the optimal number of moves: as you can see in the list, I solved a few in a smaller number of moves. To proceed to the next level, you must solve the puzzle in no more than par+5 moves. Solving the puzzles requires some thought, to ensure that as you turn the polygons the triangles line up with the right color. In some puzzles there's a reduced number of colors, which actually seems to make things harder, because you need to figure out which sides are supposed to match in order to reach the optimal solution. The main problem with this game is the user interface. For some reason, often the swipes are not correctly detected, and you end up doing a different move from what you intended. Since there is no undo functionality, when that happens the only thing you can do is restart the puzzle. Additionally, there is a counterintuitive feature where if you touch the background, the whole cluster of polygons moves in that direction. I triggered that many times with accidental touches, and then tried to reposition the cluster by dragging it—which doesn't work, and triggers moves intead. This was very frustrating until I figured it out. I think the controls need to be made more user friendly. You should be able to simply touch and drag a polygon to see how it rotates, and be able to put the polygon back on its starting position without committing the move. Also, the cluster should just be automatically centered without need for user adjustments. Support for high resolution displays and a colorblind-friendly color scheme would be most welcome. I really like the mechanics of this puzzle, which are original and require some serious thinking. It's free, so definitely it's worth a try; but if the user interface and the presentation were improved, it'd become a lot more enjoyable. Update 08/03/2013: Nathan Lindquist kindly answered to this review, promising to revise the user interface in a future update. Thanks Nathan! 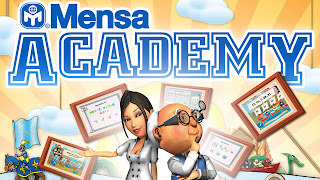 Mensa Academy by Square Enix is not the kind of game this blog focuses on, but hey, it has the Mensa brand, and it appears to be currently on sale at $0.99 (from $4.99), so it's worth a mention in case you are interested (maybe for your children). 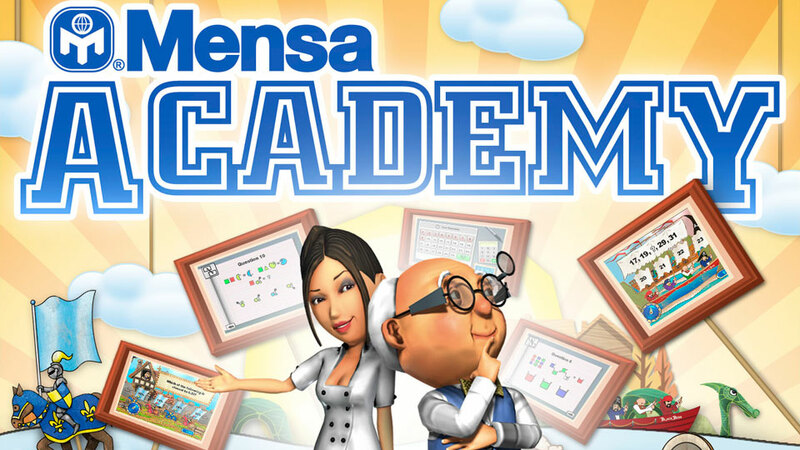 The game contains several minigames split into these categories: Language, Numeracy, Logic, Visual, and Memory. The Logic ones are embarassingly simple, at least at the first three levels. Hopefully they'll get more difficult afterwards, though they're still mostly the kind of questions you would find in a run-of-the-mill IQ test. I like the visual style, but on my iPod it looks a lot worse than in the video—it's clearly low res, and seems to have some alpha issue around the edges of the textures. Still, cheaper than this would mean free, so if you're remotely interested, this is the time to get it. It's worth talking about Puzzle Retreat, a good puzzle game by the Voxel Agents, because it is one of those rare cases where a good production value is also backed up by interesting and original puzzles. An animated hand instructs the player to touch the tile on the left, then slide over the START letters. This causes five ice blocks to rise from the tile, and slide in good order to cover the holes. Filling all holes in a grid is indeed the goal of the puzzles. Each puzzle has a different shape, and the tiles, which look like the faces of a die, contain a varying number of ice blocks. When a hole is filled by an ice block, other blocks will slide over it. The one limiting rule is that to release the ice blocks from a tile, there must be enough empty holes to accommodate all the blocks. If that isn't the case, a red animation indicates that the move is not allowed. Other game elements include arrows, which make the blocks do 90 degrees turns, and blocks with a handle on top, which cannot be passed over by other blocks. In the previous image you can also see the inventive way how the undo feature has been implemented: instead of having a single undo button somewhere on the screen, the button appears on top of the starting position of the last tile moved. The final game element is fire blocks. When they slide over an ice block, they melt it, and leave an empty hole that needs to be filled again. This significantly increases complexity. No matter how many tiles and holes there are at the start of a puzzle, at the end all holes will be filled. There is only one way to solve each puzzle, which gives a nice feeling of achievement. As the game progresses, the solution to the puzzles becomes more complicated, but it never seemed excessive in the levels I played. Logic will help a lot in figuring out the correct order of the moves, so as an extra challenge you can try to avoid experimentation and attempt finding the solution on the first attempt. The game has 100 levels to play initially, and additional 26-puzzle packs available through in-app purchases. The puzzle packs have names like "Nature" or "Mist", but this doesn't seem to obviously translate into a theme common to the puzzles (or at least, I couldn't see one). New puzzle packs are promised on a monthly basis, which should guarantee longevity—provided that you are willing to pay. I think only 26 puzzles for each purchase might seem a bit too few, and would appreciate if the developers added the ability to bulk purchase multiple packs at a discount. Still, I'll probably buy some additional pack when I finish the first 100 levels, because the game is fun. I hope new game elements will be introduced in future packs, otherwise the puzzles might become repetitive in the long run. For the technically inclined, the blog and the Facebook page also contain some interesting behind-the-scenes information about the design and development of the game. Ivan Vassilev has created many puzzle games for iPhone and iPad. I've played all of them, and my favorite is Spin Mix. This is a sequential movement puzzle, but with a clever twist. The playing area is a 5x5 grid, populated with some dots. Resting with their ends on some dots, are some pieces, whose length can be 1 or 2 units. One of the pieces is red. The goal is to move it over the red dots. Usually, in this kind of puzzles you slide the pieces around. The most famous example is Rush Hour, which is possibly the most plagiarized puzzle of all time. In Spin Mix, instead, the pieces rotate around one of their ends. You can only rotate them at 90 degrees angles, they cannot intersect each other, and the ends must always rest on the dots. This produces some interesting mechanics. The game contains 274 puzzles, sorted by the optimal number of moves needed to solve them, which roughly maps to the difficulty. Puzzle 1 requires 11 moves, puzzle 274 requires 79 moves. Unfortunately the puzzles have clearly been computer generated with no apparent human filtering. Often times, two consecutive puzzles are identical, apart from some minor change which has a negligible effect on the solution. While the mechanics are original and interesting, they get repetitive after a while, so I would have preferred a smaller set of puzzles with more variation. Thankfully, all puzzles are unlocked from the start, so you are free to skip some if you feel bored. I don't really like the options menu, which is a bit confusing and offers too many irrelevant options. Also, the game supports Game Center leaderboards, but you have to manually post your score by tapping on the button labelled "G.C. ", so hardly anyone will do that. In conclusion, I really like the mechanics of this game, but the implementation leaves a bit to be desired, and could use some more polish. Still, it's free, so it's worth a try. This creates some interesting new mechanics, especially when the beam crosses the block multiple times. Some of the 30 new levels have surprising solutions. The other day I stumbled by accident on Tile Drop, a nice free puzzle game for iPhone and iPad by Daniel Wood. The basic idea isn't new, and actually there's an interesting story behind. The mechanics of Tile Drop are the same of another game by the same author, Blockees. Blockees itself was a remake of Blockee by Rob Gibson. Both games are no longer available on the App Store. Blockee was inspired by Eliminator by Riza Purwo Nugroho, which brings us to Jakarta, Indonesia, back in 2002 at least. As you can see the rules are simple. There's a 5x5 board containing some colored tiles. When you swipe the screen, all tiles move in that direction until they hit the side of the screen or another tile. Black tiles don't move. When two or more tiles of the same color touch, they disappear. Grey tiles don't disappear. The goal is to remove all coloured tiles. And, you must do it in exactly the optimal number of moves. No discounts. The puzzles included range from easy ones requiring just 2 moves, to very hard ones requiring 10 moves. I like how the size of the board remains fixed at 5x5 and the difficulty is only determined by the layout. Here's one requiring 10 moves. 10 moves is pretty damn hard, and I don't think logical reasoning would get us far enough. The tile layout can change a lot with every move, so it's quite difficult to keep a mental image. This is really a game that needs to be interacted with, and the experience can be almost hypnotical, furiously trying different strategies and reaching for the reset button every time they fail. One thing to note is that the optimal solution isn't guaranteed to be unique: I've seen several puzzles that could be completed in multiple ways. As you can see in the image above, there's an option to get hints when you are solidly stuck. They can be bought through in-app purchases, but the game also awards them liberally. The way how you progress through the game is peculiar. After unlocking the option, you can simply generate new packs containing 10 puzzles of a given difficulty. The packs are randomly generated from a database which, according to the author, currently contains over 3,000 puzzles. The puzzle database is actually fueled by users of the game. There's a built-in editor which is very easy to use and allows to share your creations with the other players (getting hints in return). This might actually be a weakness of the game, because there will be no quality control over the user generated puzzles, which might result in most of the puzzles being boring when compared to the ones created by the game's author. Nevertheless, this is a solidly fun and extremely polished game, which deserves to be experienced.